China's stock market climbed 2.9% Tuesday as investors hope for additional stimulus from the nation's central bank following weak trade data. That optimism provided a late-day catalyst for Chinese stocks. The Shanghai Composite Index ended Tuesday's session 2.9% higher at 3,321.43. The smaller Shenzhen Index surged 3.8% to 1,821.30. Hong Kong's Hang Seng benchmark soared 3.6% to 6,292.88. Sparking expectations for another stimulus from the People's Bank of China (PBOC) was new economic data from China. Figures Tuesday showed China's imports contracted more than expected in August. Imports to the Asian nation slipped 13.8% year over year, well below the 8.2% drop economists were expecting. This was the 10th consecutive month of declines. Also spurring the late-day buying was news the National Development and Reform Commission (NDRC) had approved two new infrastructure projects. The pair of new railroad projects intended to jumpstart China's slowing economy are worth more than $11 billion. Following a three-day holiday to commemorate the end of World War II that kept markets closed Thursday and Friday, officials in the Asian nation are making up for lost time. Late Monday, the country's stock exchanges proposed plans for a new "circuit breaker" system. Authorities want to restore stability and prevent panic in China's stock markets, which have endured stomach wrenching gyrations over the last three months. 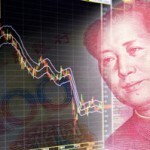 According to the proposal, trading in China's stock market would be suspended for 30 minutes when markets rise or fall by 5%. If the index jumps or declines by 7% or more, trading would be suspended for the day. The mechanism can only be triggered once a day. "Circuit breaker in both directions will be conducive to curbing excessive transactions and reining in market fluctuations," the draft from the securities regulator said. Authorities said they will also eliminate the 5% personal income tax on dividends for shareholders who hold stocks for more than a year. The ministry of finance, the taxation authority, and the securities regulator said in a joint statement on Monday that if investors sold a stock after holding it for a month or less, they would be liable for a 20% income tax payment on the dividend they receive. Investors who held a stock for between one month and a year would pay 10%. The goal is to encourage long-term equity investments and curtail short selling and short-term speculating. Monday's announcements followed a pledge by the China Securities Regulatory Commission (CSRC) on Sunday to ensure stable markets. Other measures implemented include restricting trading in index futures and options.